Nashville, TN - (March 18, 2014) - GRAMMY®-nominated artist and Christian music's best-selling new artist in the past 10 years, Francesca Battistelli, launched a pre-order today at Francescamusic.com in anticipation of the release of her forthcoming studio album, If We're Honest, due out on April 22. Her two previous albums, debut release My Paper Heart and sophomore project Hundred More Years, hit No. 1 on Billboard's Christian Album chart. With her most recent release in 2011, she garnered "Artist of the Year," "Female Vocalist of the Year" and "Pop/Recorded Song of the Year" at the Dove Awards. Produced by GRAMMY®-nominated and Dove Award-winning producer and her longtime collaborator Ian Eskelin, If We're Honest reveals her most intimate and accomplished musical statement yet and showcases her trademark pop and soul-infused sound. On February 13, Battistelli made her national morning TV debut performing the album's lead single "Write Your Story" on ABC's "Good Morning America." It is the fastest rising single of 2014 on the National Christian Audience chart and currently holds the No. 4 spot. This Thursday, the Word Entertainment / LightWorkers Media (Mark Burnett and Roma Downey) partnership "The Bible: Son of God Tour 2014," in association with 20th Century Fox feature film "Son of God" and epic mini-series "The Bible," launches at Rick Warren's Saddleback Church in Southern California with Battistelli, Sidewalk Prophets, Natalie Grant, Chris August, Meredith Andrews and Jason Gray. Fans of Battistelli can choose between two exclusive album-themed packages featuring the deluxe version of If We're Honest on CD and digital download. 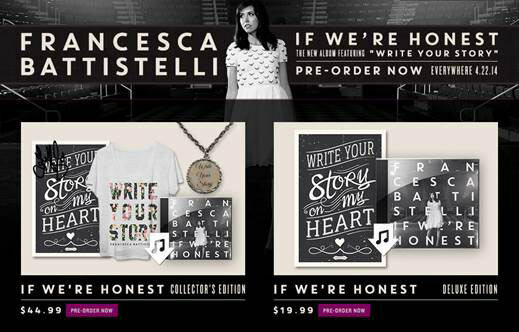 Additionally the If We're Honest Collector's Edition features an art print autographed by Battistelli and new merchandise inspired by her hit single, "Write Your Story." The album is also available for pre-order on iTunes with its first three tracks, "Write Your Story," "When The Crazy Kicks In" and "He Knows My Name" available as instant downloads. Additionally, Family Christian is offering a pre-order with an exclusive track, "Just The Same." Patrons that pre-order If We're Honest from Lifeway, will instantly receive a physical version of "Write Your Story." Since her debut in 2008, Francesca Battistelli has earned a GRAMMY® nomination (Best Gospel Performance), six Dove Awards including 2011 "Artist of the Year" and 22 Dove Award nominations. Both her debut album, My Paper Heart (certified gold in 2012), and her 2011 sophomore release, Hundred More Years, took the No. 1 spot on Billboard's Christian Album chart. With over 978,000 in album sales to date and over 1.8 million single downloads, she is the best-selling new artist in the genre in the past decade. Her music has also been featured on TriStar Picture's "Soul Surfer," Columbia Picture's "Julie and Julia," TLC's "Jon & Kate Plus 8," ABC's "Extreme Makeover: Home Edition," NBC's "The Biggest Loser," Fox's "So You Think You Can Dance," and several other television and movie outlets. In addition, this past fall she was featured on over three million Diet Pepsi Cans throughout the U.S.